[Updated below: May 2, 2017, May 10, 2017, May 22, 2017, and Jan. 19, 2018] Cornell has made transition plans [or try here (pdf) if Cornell’s link is no longer working] for the construction of a Fine Arts Library (FAL) in Rand Hall in order to accommodate the various library, wood shop, metal shop, and digital fabrication functions, currently in Rand Hall, that will be out of service during the two-year construction period. Not mentioned in these transition plans are two items that actually affect Milstein Hall: the 2nd-floor Rand Hall toilet rooms that are used by faculty and students in Milstein Hall (since no toilets were provided on the 2nd-floor Milstein Hall studio level) and a third required exit stair for Milstein Hall’s 2nd-floor level, currently in Rand Hall. I’ve asked the AAP Dean and the FAL project manager what plans are in place for temporary toilets and egress, but have not yet gotten a reply. In the meantime, I’ve published a Cornell Chronicle parody on that subject. I haven’t received a reply to my last email, dated April 10, 2017, so I’ll repeat my main questions and concerns. Since the questions are technical in nature, and since you are the responsible mechanical engineer for this project, I would appreciate a response directly from you. The safety data sheet for the “Stratasys” printer says that it should be used “only outdoors or in a well-ventilated area,” and the 2015 NYS Mechanical Code seems to require that “Ventilation systems shall be designed to have the capacity to supply the minimum outdoor airflow rate.” Your plans for 240 E. Sibley don’t seem to have any mechanical ventilation system for outdoor air—only transfer grilles that pull in return air from the adjacent spaces. (1) Where is the required outdoor air coming from for this room? (2) How is your design consistent with the manufacturer’s recommendation that the printer be used “only outdoors or in a well-ventilated area”? (3) How can you be sure that particulate matter containing toxic or carcinogenic byproducts from the printer will not be exhausted directly in front of the rear entrance to Sibley Hall and a short distance from the food truck? The context for my concern is that the material used by the printer is both toxic and carcinogenic, and nanoparticles are created as a byproduct of the printing process, some of which are so small that they pass through HEPA filters. Carcinogenicity: Classification based on data available for ingredients. Contains a known or suspected carcinogen. From http://www.uvm.edu/safety/shop/3d-printer-safety: Nanoparticles (ultrafine particles less than 1/10,000 of a millimeter) are one of the by-products emitted during the 3D printing process. Recent studies have shown that 3D printing using a low-temperature polylactic acid (PLA) feedstock can release 20 billion particles per minute, while a higher temperature acrylonitrile butadiene styrene (ABS) feedstock can release 200 billion. • Can interact with the body’s systems, including the skin, lungs, nerves and the brain. Exposures to nanoparticles at high concentrations have been associated with adverse health effects, including total and cardio-respiratory mortality, strokes and asthma symptoms. While PLA feedstock is designed to be biocompatible, the thermal decomposition products of ABS feedstock have been shown to have toxic effects on lab rodents. Links to all my writings and blog posts on the Fine Arts Library can be found here. 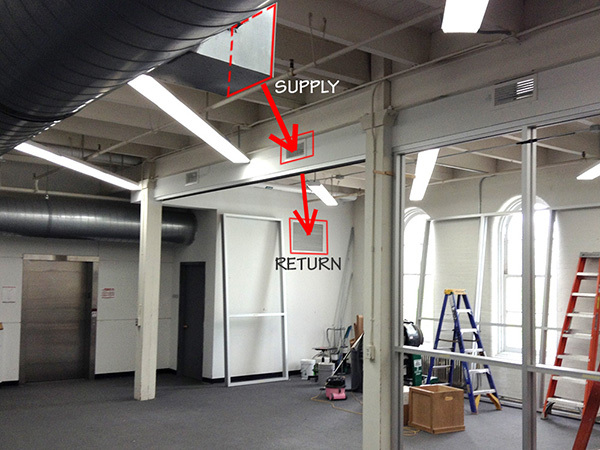 [UPDATE: May 2, 2017] I still haven’t heard back from “the Project Team”; meanwhile construction is underway, and one can easily see how any fresh air originating in the existing duct outside the room that manages to find its way through the grilles (at the top of the storefront partition) will be sucked directly into the existing return grille, also at the top of its wall, without providing much benefit to the occupants within the so-called “breathing zone” (Figure 1 below). In fact, it’s possible that particulate matter from the 3-D printers will find itself in a zone with no air movement at all, given the geometry of the room and the placement of grilles only at the top of the walls. Thank you for your question regarding the transition. Regarding egress, my understanding is that an egress stair will be provided directly from the Kwee studios by removing a glass panel and providing a temporary egress stair. I am told this will be part of the CD drawings. Regarding the bathrooms, the project team is working with the city to determine the number of accessible and non-accessible fixtures not including Rand Hall. A solution is not yet final, but the team is aware of the issue. Thanks for stopping by today and confirming that each 3D printer will now be placed in a separate “box” that filters air for nanoparticles and VOCs before returning the air to the room. This seems better than the original design in which the 3D printers were placed in the temporary digital fabrication lab (240 E. Sibley) without any specialized exhaust system. Still, even if 99.97% of nanoparticles are captured in this way, the 0.03% that escape constitute a potential release of 20,000,000,000 x 0.0003 = 6,000,000 toxic and carcinogenic particles into the breathing zone per minute. (“Recent studies have shown that 3D printing using a low-temperature polylactic acid (PLA) feedstock can release 20 billion particles per minute” – http://www.uvm.edu/safety/shop/3d-printer-safety). Question 2 and its answer… confirm that the digital fabrication lab is not directly provided with outside air, but instead: “The Makeup Air Unit in Room 200UA delivers fresh air to the second floor. This air is then transferred into Room 240 through grilles located at the top of the glass partition wall.” Based on a conversation I had with Senior Technical Staff of the International Code Commission (ICC), transferring outside air from a corridor into the digital fabrication lab would not be compliant with the 2015 Mechanical Code. However, since the corridor seems to be now labeled as a room (“collaborative area”), it’s probably legal, but barely. The opportunistic and ad hoc manner in which such design decisions are, and have been made, does not inspire confidence. Relatively little is known about the risks of exposure to 3D printers. A recent study says: “It is well-known that both gases and particles are emitted during thermal processing of many thermoplastic materials. However, little is known about the types and magnitudes of emissions from desktop FFF 3D printers and how they vary according to filament material or printer characteristics. In 2013, we published the first known measurements of emissions of ultrafine particles (UFPs: particles less than 100 nm in diameter) resulting from the operation of a single make and model of commercially available desktop FFF 3D printer using both ABS and PLA filaments. These findings were crucial, as exposure to emissions from thermal decomposition of thermoplastics has been shown to have toxic effects in animals, and exposure to UFPs from other sources has been linked to a variety of adverse human health effects.” (Parham Azimi, et al., “Emissions of Ultrafine particles and Volatile Organic Compounds from Commercially Available Desktop Three-Dimensional Printers with Multiple Filaments,” Environmental Science & Technology, at http://pubs.acs.org/doi/pdf/10.1021/acs.est.5b04983, emphasis added). It saddens me that students, faculty, and administrators in AAP feel the need to introduce toxic and carcinogenic materials into the educational environment. The competition to keep pace with our peers, and to prepare our students for professional practice in architecture, has apparently reached the point where even Monty Python’s prescient “Architect’s Sketch,” featuring “rotating knives” in a corridor where “blood pours down these chutes,” seems like a quaint anachronism. On another note, I was told by the AAP Director of Facilities that no new toilet rooms will be provided for architecture students during the time when code-mandated toilet rooms in Rand Hall become inaccessible due to construction of the Fine Arts Library. Instead, a code variance will be sought. [UPDATE: Jan. 19, 2018] Cornell has successfully petitioned for a New York State code variance (Petition No. 2017-0515) so that they will not need to provide an adequate number of toilets during the construction of the library in Rand Hall. 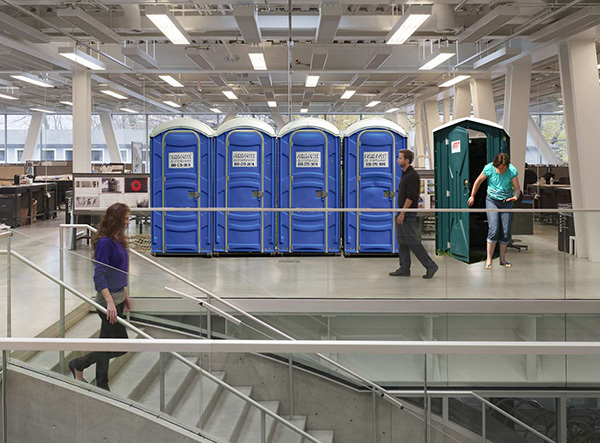 There is only a single (shared) toilet for men on the entire second floor of the combined E. SIbley-Milstein Hall, a floor which encompasses an area of over 30,000 square feet and contains well over 300 occupants (with a legal occupancy over 500). In addition, Mike Niechwiadowicz, Ithaca’s Director of Code Enforcement, made a determination that a third exit was not required from Milstein Hall based on the “occupancy of the L.P. Kwee Studios” on the second floor of Milstein Hall. It’s not clear whether he also considered the classroom/critique spaces on the second floor of E. Sibley Hall that exit through Milstein Hall and therefore increase the occupant load beyond what would be computed if considering only the L.P. Kwee Studios in Milstein Hall. Based on past experience, it’s unlikely that there are any calculations to support his judgment. Niechwiadowicz, you may remember, is the very same “code expert” who insisted that Milstein Hall’s crit room needed only one exit. Needless to say, his code opinion was overturned at the July 18, 2013, meeting of the NY State Capital Region Board of Review and Cornell was forced to create, at great expense, a second exit from the crit room space—by breaking through the wall separating the crit room and the auditorium. This entry was posted in Architecture, Milstein-Rand-Sibley Hall, Writings on April 30, 2017 by jonochshorn.